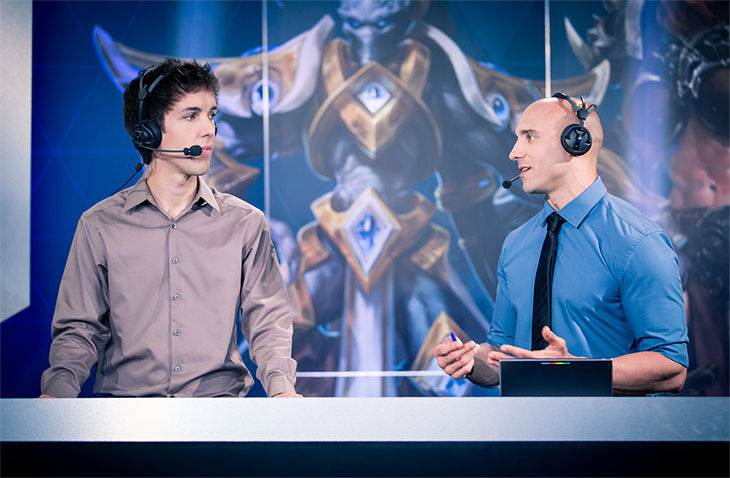 Interview w/ Khaldor: "I can't wait...to start"
Khaldor has a deep history with Blizzard games ranging a period of over 10 years, from his earlier days of shoutcasting Warcraft 3 to his debut in GSL Code A for StarCraft II to over two years of continuous casting, commentary, and analysis for Heroes of the Storm. As such, there's no doubt that he's the perfect fit for the job, and many have been eagerly waiting for his return to casting. I was incredibly fortunate to catch his attention in early January for an exclusive interview. After he finally acquired the work visa, we chatted about the next chapter of his life and the new adventure that awaits him across the ocean at Blizzard's production studio. We also talked about his aspirations for HGC, plans for the next phase of his life, and the future of Heroes of the Storm. I'm proud to present his thoughts here, and I can't wait to see what's in store for the game as we head into undoubtedly the most successful year so far. Well, I guess the first difference is that this time I already know that I'll be staying for quite some time. When I traveled to Korea to commentate the GSL, I was only supposed to stay there for three months and ended up being there for three years in the end. With the move to the US, I'm from the start aware that I'll stay long enough to justify things like renting out an apartment from the get-go, buying a car, and so on. That's a big difference when it comes to the preparations. And even though the recent politics sure are a roller coaster for the US, it will be much easier for me to adapt to another Western culture compared to the Korean lifestyle I had to adapt to when I moved to Seoul. I expected for quite some time that there might be an opportunity in the US. In the second half of 2016, I was already pretty sure that I would not stay in Germany for too much longer. I was thinking about moving to another European country (Spain in particular), and one of the reasons those plans never became concrete was that there was a pretty big chance that Blizzard might want to establish a league system for Heroes of the Storm which would, by default, require the casters to be bound to a specific location. The rumors were around for some time, so it didn't come as a shock when Blizzard revealed details that confirmed it. For the casting team, those plans became more detailed during BlizzCon when most of us also had interviews set up for the open positions. The decision on who'd be casting the league was made after BlizzCon, [which is when I] also started the planning phase for the move and, of course, the necessary working visa. Yes, the visa process took quite a long time since we had to apply for a proper working visa that would allow me to move and work in the US for an extended period of time. Thankfully though, that's all sorted out now, and I got my passport including a valid working visa a few days ago. In my last interview with you, we touched on the difficulty of getting “in” with Blizzard during the early period of HotS...now you're definitely “in”. How does it feel? There were definitely moments in 2015 when it wasn't really easy for me, but I have to say that I was very happy to be so heavily included in 2016. 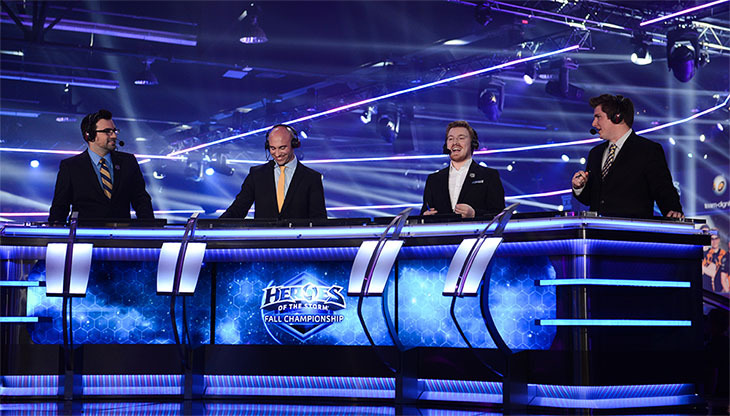 I casted at every major European and Global event throughout the year and the highlight was of course to be part of the casting team at BlizzCon—which was for sure one of my highlights in Heroes of the Storm thus far. Coming back to your question though, I have to admit that this is now a completely different level of involvement. It feels absolutely amazing to be chosen as one of the four official casters to commentate Blizzard's HGC. Even though I haven't had the chance yet to be part of the live production, the team included me wherever possible, and I can't wait to be on-site to do my part. Another big plus for me is the proximity to all the other departments working on Heroes of the Storm. I was always very interested in the game outside of esports, and simply having the option to talk more directly to people that I so far could only contact via email is amazing to me. I'm super happy about the opportunity, and I can't wait for it all to start. In the Western scenes of Europe and North America, that poses a much bigger challenge. Especially since, for a lot of players in Western cultures, it'd be huge commitment that they might not be ready for yet. A move might include giving up another job and diving headfirst into a potentially risky career in esports or giving up a place at a university or even jeopardizing a relationship. To justify such a move, the financial benefits would have had to be enormous. I was always very doubtful if such a step would be justifiable at this point. An online league, on the other hand, also faces a lot of challenges. One of them is the lack of having the players and commentators on site to provide the audience with live shots. The lack of opportunities for the Heroes of the Storm audience to meet the players and enjoy live events can also be problematic. I'm super happy that Blizzard identified all those issues and came up with a system that allows for a fantastic experience for the audience using several offline events throughout the year, a local studio to increase the production quality and including pre-recorded player shots, live interviews, and much more. I was, by the way, extremely happy about their announcement to pay the players a fixed salary for attending the league. That alone opens up so many opportunities for the players, encourages them and Open Division teams, and allows for a penalty system to ensure that rules are being followed. So even though I was quite skeptical at first, I have to say that they did a great job, and the end result is amazing. The show has been doing very well, and I'm sure it'll improve even more over the course of the next few months. I will still continue to commentate smaller tournaments. HGC will obviously be my main priority, but I'm very serious about continuing to commentate on my private channels as well. I still have several META Madness ideas that I want to realize once my transition to NA is complete, and I still want to cover online tournaments and also the occasional amateur league match. One of my goals was always to help out the grassroots scene, and that has not changed. It's important to me that smaller leagues and tournaments get more attention, and especially Heroes Lounge and Chair League have made fantastic progress in the last few months. There's a lot of up and coming players out there that have potential, and those leagues and tournaments are a first step for them to receive some exposure and transition into more competitive teams. I feel it's always a bit of a balancing act. When it comes to my livestreams and the VoDs, I do everything by myself. So during a broadcast, I talk to admins and players about upcoming games, make sure I get invited to the lobbies and look for upcoming games that might be of interest for the audience. Production, observing and of course the commentating itself are also all done by me including the post production, which entails the video editing of the games that I upload to YouTube. Since it's quite a lot to handle as a single person, I usually try to find a good middle ground when it comes to "cutting corners". There are a few things that I would love to provide and technically could but where I simply lack the manpower to make it happen. A good example would be instant replays. I'd love to use those, but it's not possible without a second person to help me with the production, and I'm simply not in a position where I can pay someone to do that. So there's always a bit of a trade off when it comes to production quality. I try to provide the best show that I can to my audience, but there's certain aspects where I will always have to make compromises. We're only a few weeks in, but do you think the level of play has risen across the board in HGC due to more consistent competition and compensation to allow the players to focus on playing full-time? Yes, for sure. The level of play has risen already, and I'm sure that trend will continue. It's also reflected in the amount of time that players currently invest into their practice. I'm watching scrims on a daily basis at the moment to see how players adapt to the patches and changes in the meta. The new system also allowed the teams to prepare in detail for a specific opponent, analyzing drafts and preparing builds. One still has to remember though that, as you pointed out, we are only observing the first effects of this new system. I'm sure that given time, the effects will be much more distinct, especially since other Open Division teams are eager to push into the league as well, which in turn raises the level of competition and play on the amateur level. One of the biggest advantages of Korean and Chinese teams, on the other hand, was always their mechanical superiority and their fantastic team coordination. But I personally believe that the gaps that we've witnessed in the past are becoming smaller and smaller in these areas. Fnatic was able to prove that during BlizzCon by taking down MVP Black, and I believe there is an actual chance that a Western team could have a realistic shot at winning BlizzCon at the end of 2017. Differences in meta are also one of the most fascinating things to observe during international tournaments. Teams have to be able to adjust incredibly fast to challenges that are imposed by facing off against a different playstyle, and it's super entertaining to watch. It's one of the reasons why I'm so excited for all these events that we will have this year! Haha, not a fair question! I think my two favorites at the moment would be Misfits and Fnatic. As a fellow German, I'm obviously always rooting for the "home" team, and I think Misfits has proven in 2016 as well as this year that they are an absolutely amazing team with incredibly strong players. But I'm also very close with Fnatic and still admire the way they have been able to grow during the last year. Their journey from being a talented but over-aggressive team at the start of 2016 to the disciplined powerhouse that we all witnessed during BlizzCon was amazing. But at the same time, they are now of course in a very different position. They have to prove that they did not get complacent and BlizzCon was not a fluke. With the level of competition continuously rising, they have to make sure that they don't start to slack off or other teams will be able to leave them behind. I just recently thought back to that interview. I think I also recorded a video back then talking about my hopes for the game. I honestly believe that Heroes of the Storm is the most entertaining MOBA game to watch. If I didn't, I would not be casting it anymore. The game eliminates all the criticism that I have toward other MOBA titles, and things like the map diversity and short game length give it a big advantage in my opinion. At the same time, things have obviously not developed that way in the past. I personally think Blizzard made a lot of mistakes in the past that made it difficult for the game and the esports scene to develop as quickly as I was hoping for at the time of the interview. I believe the game could be much bigger than it already is, but I still think that it will grow a lot more in the future. Blizzard has been working hard to improve the esports infrastructure for Heroes of the Storm and the game itself, and setting up HGC was a major accomplishment. A lot of the initial momentum has been lost though, and we will have to work hard to regain that momentum and continuously improve the game and the esports aspect of it. That's also something where I see an obligation for myself. Quite often, I come across as overly critical. One of the reasons for that is that I believe in this game and its potential. I'm very passionate about Heroes of the Storm and I want to improve the status quo and raise awareness to aspects that I think should be improved upon, and I will do everything that I can to personally help Heroes of the Storm keep growing. I don't think the goal has to be to beat League of Legends or Dota 2, but it certainly should be our goal to do everything we can to show other players how much fun and how amazing Heroes of the Storm can be, especially on a competitive level. The next time I'll be casting will be in Katowice for the Western Clash! Shortly after the event, I'll be moving to the US and will start to commentate the HGC Europe matches together with Trikslyr once the second half of Phase 1 starts in April. A huge thanks to Khaldor for giving us insight into his plans for 2017! We wish you all the best and look forward to seeing you back in action in the Heroes Global Championship! Really good interview. 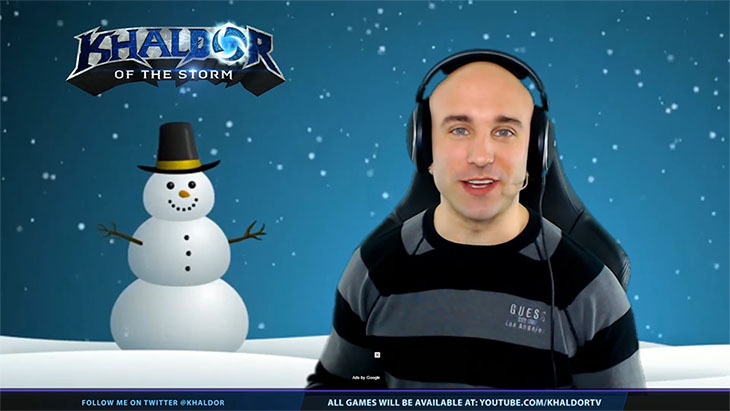 I've always been a big fan of Khaldor and his casting and I'm sure he will do great. About the production quality he has it's something too really appreciate about him cause it's consistently good, and even if he has to cut some corners due to being alone, I think he picks the right courners. I too believe this game can grow way more as well, however Blizzard needs to keep investing. I'm liking HCG so far. It's a shame he'll be casting with Trik and not Kaelaris. Khaldor and Kaelaris would be way more hype and, well, better. I believe Khaldor should not cast any important matches. Hype and excitement =/ SCREEEEAAAAAAMIIIIING FOOOOR 30 SECOOONDDSSSAAAAAA!!!! Just watch till end of game. Its 4 min anyway. In general, the Khaldor/JHow cast was really loud...I muted it. That said, I feel like Khaldor shines in a solo cast where he can show off his play by play casting as well as analysis. Will be interesting to hear him cast with Trikslyr, but I don't think it'll be nearly as raucous as everyone seems to expect. (Also, Kaelaris has a tendency to yell too...I don't know why people are giving him a break lol). Excuse the quality but you get the point. Khaldor is great, and I'm really looking forward to him. He's thoughtful, analytical, knowledgeable about the EU scene (which Trikslyr isn't at all) and gets hype af when the moment is right. He won't get SUPER hype in HGC matches like he would at a major tourney like Blizzcon, cause the situation doesn't call for it - he doesn't yell in his own streams, for example. I think saying it will be 'unwatchable' is pretty dumb. I wish Kaelaris would stay too, but Khaldor is great. I guess mine is an unpopular opinion, but I really liked Khaldor back when he did Code A. And I'm a guy that usually only likes the very analytical commentators. Anyway, glad he's having success in HotS. Second one is just "Agüeroo... I swear you'll never see anything like this again" If screams are that short its okay. Its fine. I think Khaldor is a decent solo-caster, but he constantly wants to outsmart, outhype and overshadow his co-casters. The opposite is Artosis, who always brings out the best of whoever he is casting with, complimenting, filling gaps and laughing at his jokes. I'm glad to have Khaldor back in the game. I like his more "casual" approach and also the hype. Seeing him and Trikslyr analysing the drafts will be amazing (I was quite impressed with Trikslyrs calls) since Khaldor is really into drafting as well. The guy was also the one and only pillar of the EU scene for a long, long time. If it wasn't for him, I believe the viewerships would be quite a bit lower still today. Yeah, it's not like bad puns are unheard of in the internet. Did the math when HGC 2017 was first announced: the budget is about the same overall as last year (~$6M). Viewer numbers on average are already 3x what they were in 2016, so that's some pretty significant growth. Anyways, what does this comment have to do with the interview?? Well I guess it's because Khaldor mentioned the game can still grow, which I believe it can, and I think it's currently doing although slowly. So... Dreadnought and Grubby aren't casters? I think you're being pretty unfair. Casters getting hyped and yelling over an insane base race in a world championship semi-final does not mean casters will senselessly yell at every teamfight. If anything, Khaldor is far more likely to go into 'rap god' mode where he play-by-plays the entire fight (which is insanely impressive, incidentally). If you watched his commentary on his stream, you would be aware he does far more than just getting hype and yelling, which he usually reserves for live events. Grubby is a HotS caster? I kind of lost interest when they announced they would call it HotS instead of BAlls, which I thought was a ten times better name. They're pushing their name as a brand now, so I'm sure they regret the decision themselves. Anyway, Grubby casting this game would kind of make me interested again. Grubby casts the amateur EU open league, in which the top teams at the half way point of the season get a chance to play the bottom HCG teams for a chance to take their spot. Great interview, have been missing Khaldors casting. Though I am sad that Kaelaris will be going am really looking forward to Khaldor filling his place. Him and Grubby are the ones who got me into watching/playing HotS. Him and Grubby did a nice job with content creation, even though they were probably disappointed about the size og HotS as a game and e-sport. Changing game like that is a big risk, and they did not look back to sc2 much. The guy still rubs me the wrong way, though, but maaaybe he reads this and can get better? It is about presentation rather than knowledge, casters have improved leaps and bounds before. I think the main problem with Khaldor is not exactly the fact he screams. But his volume changes so much. I often use headphones, my volume stays high enough to hear both the cast and in game sounds (unless people mess up this balance). Then the caster suddenly destroy my ears, because he speaks softly for 5 minutes and then screams loudly. Said that, its the only thing bad about him. He is a knowleadgeable caster, he can hype a game and does the play by play like a rap god as said above. Don't wanna sound overly critical, he is doing a great job. The entire Heroes "casting squad" is pretty good imo, very professional despite the sillyness of some of them. In PvZ the zerg can make the situation spire out of control but protoss can adept to the situation. Awe, it's HoTS, got my hopes up. Still cool tho.